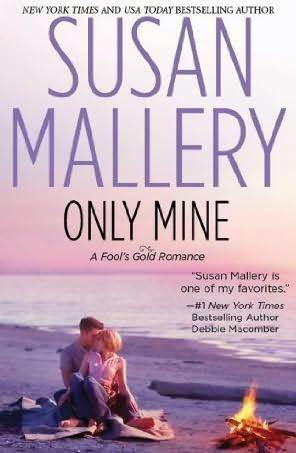 I’ve been a huge Susan Mallery fan since I put a call out to my Twitter followers for great contemporary romance books about a year ago. Since then, I’ve devoured almost her entire back list, and gobble up everything new I can get my hands on. Only Mine is the 4th installment of the Fool’s Gold Series, one of my favorites! Dakota is one of the Hendrix triplets, and with her psychology background, was guilted by the mayor to work with the Hollywood TV crew in the small CA town of Fool’s Gold. Since the world found out about their man shortage, the town has had to deal with some crazy things, but a dating show just might be the craziest. But Dakota will do what it takes for the town, and if helping with the production is what she has to do, she’ll damn well do it. But she never expected Finn. Finn has come down to Fool’s Gold from Alaska, chasing his younger brothers and hoping he can change their minds against going on the TV show. But Stephen and Sasha have other plans. Finn sticks around to try and change their mind, but finds himself running into Dakota time and time again. When the show comes to an end, will anyone in Fool’s Gold have actually found love? I was anxiously awaiting to find out more about the Hendrix triplets, and was somewhat surprised that we didn’t see more interaction between the three, but at the same time I loved getting to know Dakota better. She had gone through a really devastating event with finding out she wouldn’t be able to have kids, and watching her struggle with trying to adopt as a single parent was so touching. I loved Dakota, thought she was a great strong heroine and a joy to read. I also liked Finn, despite his overbearing and somewhat annoying tendency to treat his adult brothers like they were toddlers. I liked watching Finn grow from this overbearing Alaskan backwoods man; coming out of his shell and finding that what he has always known might not be the best for him. I loved the relationship between him and Dakota, how supportive he was of her at every corner, and even the way he handled himself at the end of the story. I really thought Mallery did a wonderful job with his reaction to Dakota’s “news” and how he discovered he was in love with her. It was very well done! For the secondary story lines of Finn’s twin brothers Sasha and Stephen, I had some mixed feelings. I really liked Stephen, the more subdued and laid back of the two. I loved his relationship with Auriel and how they really found a way to compliment each other, despite their gap in ages. I just wish that the storyline surrounding her mother hadn’t been so depressing and ugly. It was a little disheartening to read. Unlike Stephen, I found Sasha to be shallow and childish. I could see why Finn treated him like a two year old. Sure Sasha seemed to know what he really wanted to do in life, but the way he went about everything just reminded me of a spoiled child. I wish we would have had the chance to see him grow up a bit. All in all, Mallery is back with another stellar contemporary romance filled with passion, love and a sense of community. I love the Fool’s Gold cast of characters and was happy with these additions. I can’t want to see what is in store for us with the other Hendrix triplets. Mallery fans will not be disappointed! I give Only Mine a B. It was the first book I read by this author and I really found it cute. So cute that I already started the next book and ordered the previous one. I really loved Finn’s reaction at the end. It felt so realistic and yes well handled. I was so excited to return to Fools Gold and Dakota’s story didn’t disappoint! Susan’s fictional California town has me wishing I lived there, Man Shortage and all! @Kelly – ME TOO! I love small town romance books. There is just a great sense of community and togetherness that I adore! I’m with you, I really had mixed feelings about the twins. For most of the story I was finding I felt aggravated that they were there at all. Towards the end I was feeling better about them. I loved every moment when the sisters were together. I have 3 little sisters and we are all super tight, so the moments of conversation between them warmed my heart and made me think of my own sisters. @Jenn – I loved the sisterly moments as well. I hope we get to see more and more time of them together!! I actually liked it that Sasha was such a two year old. It made Finn’s response to their leaving college make more sense. Otherwise, he would have just been overbearing and demanding. With Sasha not quite grown up, you knew why Finn felt he needed to be there and make sure they were okay. I loved the subplot with Stephen and Aurelia. I have several friends who are dealing with mothers like that. It’s sad and it’s hurtful that a mother could treat their child that way, but it does happen. That just made the book more real for me. @Angela – Yea, I can’t imagine my mom dating again, so that’ll be fun to see how the triplets handle that whole scenario. I’m super excited for Only Yours as well!! I was hooked from the first scene! I love Dakota’s sense of humor and I can easily relate to Finn’s devotion to his family. I, too, feel the need to take of care of everyone 🙂 I’m excited to see what happens next month in Fools Gold! From that first page when Dakota says “You have a lot of attitude for someone wearing a plaid flannel shirt”, I was hooked!